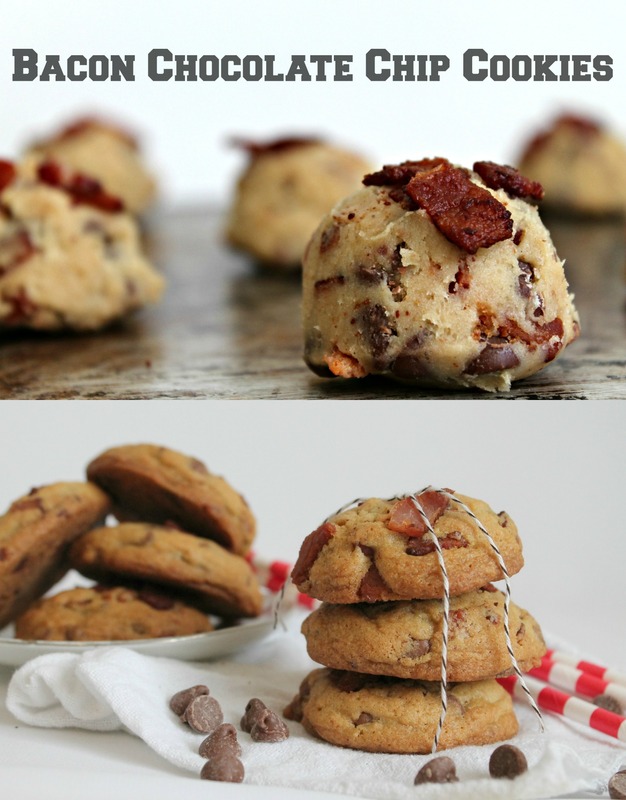 The bacon trend is still going strong and these Bacon Chocolate Chip Cookies are the perfect treat to indulge in! Dunk them in your coffee or make ice cream sandwiches! My husband does not have a sweet tooth. He’d take the cheese platter over the chocolate cake any night out. He prefers to have a gin and tonic over a milkshake. He’ll pass over a warm brownie for some chips. Shocking, isn’t it? Even more so, it’s ironic since he married a professional baker that spends her day working with doughs and batters. But there is a silver lining to all this and it’s the he loves cookies. Not any cookies, but specifically chocolate chip cookies. It’s the only time I see him consuming sweets by the dozens and it makes my heart happy to see him eating and loving my baked goods. Another favorite of my hubby is bacon. Bacon on burgers, bacon in sandwiches, bacon in basically anything and everything. He says the fattier, the better. He craves that salty, meaty flavor. He’ll make me cook up some bacon to “snack” on. He loves bacon that much. So when working with Smithfield on a bacon recipe, I decided to combine two of his favorites: bacon + cookies = bacon chocolate chip cookies! 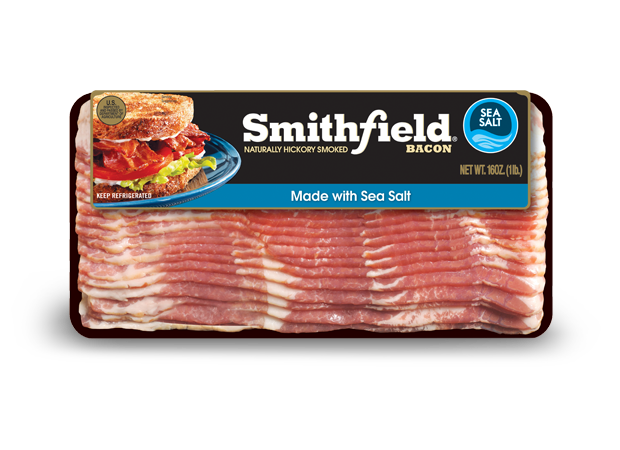 For this recipe, I used Smithfield Bacon – Made with Sea Salt and it really balances out the sweet chocolate with the salty bacon. The added sea salt makes you crave more and more cookie – heck, these would also be a perfect bar snack if made into a mini-version! Not a unique recipe at all, since bacon has been on the trend radar for the past 2-3 years and as much as people want the trend to die down, it’s not going anywhere. Bacon satisfies the most carnal of desires, the craving of fatty, salty, delicious MEAT. Check out this Smithfield Infographic for more fun facts and trivia on the most loved meat, bacon! 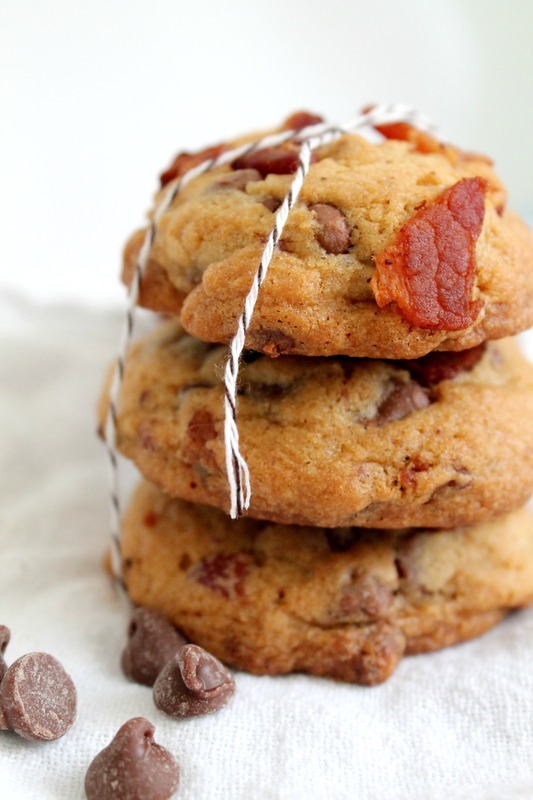 These Bacon Chocolate Chip cookies are sweet, salty, and all around delicious! Cream the butter, sugars, and vanilla extract for 5 minutes. Add egg and mix until incorporated. 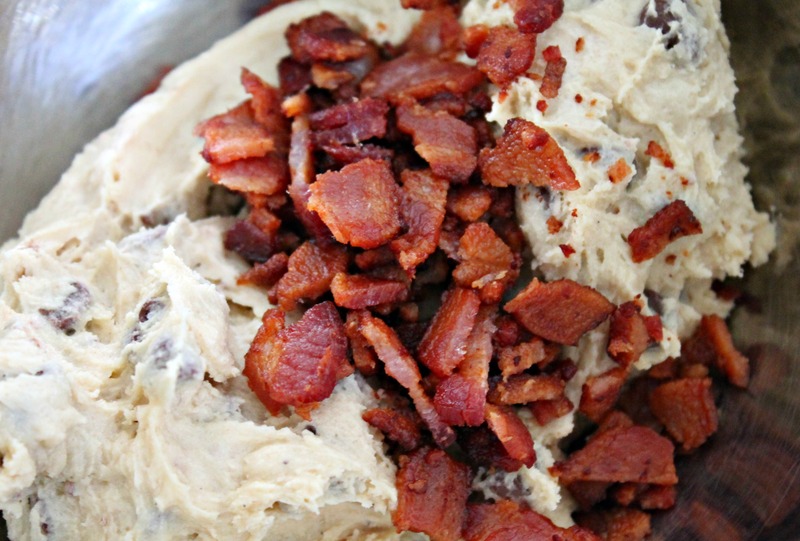 Dump in dry ingredients, chocolate chips, and chopped bacon (reserve 1 tablespoon bacon to top cookies). Mix until all ingredients come together and form a homogenous dough. Using a small ice cream scoop, scoop cookies onto baking tray, top with reserved bacon, and bake for 12-15 minutes, until golden brown around the edges. Recipe adapted from the Nestle Tollhouse Chocolate Chip Cookie recipe. Disclaimer: This is a sponsored post for Smithfield. I was compensated for my time. Thank you for reading Cooking with Books and supporting the brands that make it possible for me to bring you delicious recipes! Bacon is not a trend–it’s life! Bacon chocolate chip cookies are awesome!!! I call them the gateway sweet to bacon in desserts. 😉 Lovely photos, too! Stop, it’s just too much. YUM! This is genius and I love the sweet and falt flavors! I would like to place my order for a batch or two, please!! Gosh I want these cookies SO bad right now. OH my Marnely….is there a more perfect cookie? I don’t think so! I love chocolate and bacon together though I don’t think I’ve ever had them in a cookie. Genius idea. GIRRRL! These cookies look intense! So perfect and then baaaacon! amazing! Wow! My husband would be all over these! Everything is better with bacon – these look great! Definitely have to make these, I might have to substitute some of the butter with rendered bacon grease! My two little boys would probably go crazy over these, they love bacon more than I…if that’s even possible!